April 2015 n Performance & Hotrod Business n 41 with what's going on for the day. I spend a lot of time with my team. Some days are very rigidly structured, others are more relaxed. But, it seems like they're all busy. 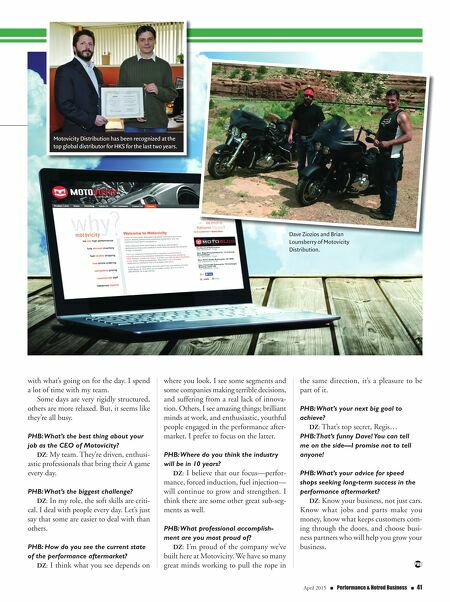 PHB: What's the best thing about your job as the CEO of Motovicity? DZ: My team. They're driven, enthusi- astic professionals that bring their A game every day. PHB: What's the biggest challenge? DZ: In my role, the soft skills are criti- cal. I deal with people every day. Let's just say that some are easier to deal with than others. PHB: How do you see the current state of the performance aftermarket? DZ: I think what you see depends on where you look. I see some segments and some companies making terrible decisions, and suffering from a real lack of innova- tion. Others, I see amazing things; brilliant minds at work, and enthusiastic, youthful people engaged in the performance after- market. I prefer to focus on the latter. PHB: Where do you think the industry will be in 10 years? DZ: I believe that our focus—perfor- mance, forced induction, fuel injection— will continue to grow and strengthen. I think there are some other great sub-seg- ments as well. PHB: What professional accomplish- ment are you most proud of? 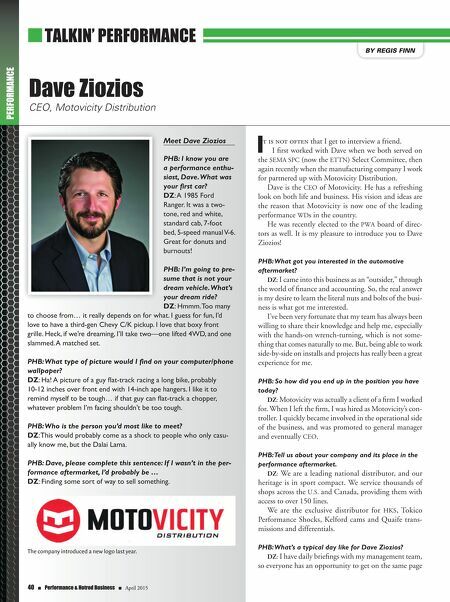 DZ: I'm proud of the company we've built here at Motovicity. We have so many great minds working to pull the rope in the same direction, it's a pleasure to be part of it. PHB: What's your next big goal to achieve? DZ: That's top secret, Regis… PHB: That's funny Dave! You can tell me on the side—I promise not to tell anyone! PHB: What's your advice for speed shops seeking long-term success in the performance aftermarket? DZ: Know your business, not just cars. Know what jobs and parts make you money, know what keeps customers com- ing through the doors, and choose busi- ness partners who will help you grow your business. Dave Ziozios and Brian Lounsberry of Motovicity Distribution. Motovicity Distribution has been recognized at the top global distributor for HKS for the last two years.